Presidential elections, Ukraine, 2004. One candidate is backed by the post-Soviet regime. Eight weeks before the election, the opposition candidate is mysteriously poisoned. He survives, but with a severely disfigured face. In the final voting, blatant vote fraud hands the election to the regime. Instantly, people pour into the streets by the hundreds of thousands. Fed up with censored media, corruption, and rule by wealthy oligarchs, they have voted for change, and now they are taking over the capital, Kyiv, to enforce their will. Through snow and freezing temperatures they stand their ground, blockading government buildings, demanding a new election. 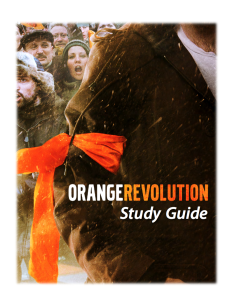 Through the eyes and in the voices of the Ukrainian people, Orange Revolution tells the story of a people united, not by one leader or party, but by one idea: to defend their vote and the future of their country.